Just four days after commissioning, cruising the inky surface of the English Channel, headed for Portsmouth naval base, when Lieutenant Commander George Tomlinson, skipper of Canada's first killer submarine gave the order to dive. The captain watched the descent through the sharp eyes of the attack periscope. In the eerie red light maintained in the control room to protect vision for the periscopes, five men guided the submarine on 45 minute voyage down 100 feet into the sea and back to the surface. At the airplane-like, one-man control column on the port side, veteran submariner M.P. Keough pushed the column to tilt the forward diving planes and began calling off the depth in feet…42…65…74 till the required depth was reached. HMCS Ojibwa, was not long in proving her worth. Less than four months after commissioning, Canada's newest submarine crossed the North Atlantic from the coast of Britain to the coast of Nova Scotia without once coming to the surface, a feat that would do credit to a well-seasoned submarine and crew. 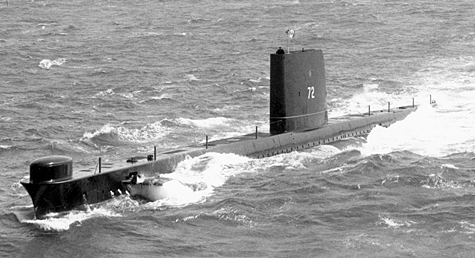 The Ojibwa submerged off the Lizard (England's most southerly point) on January 14th 1966 and surfaced 10 days later off Halifax. The complete log transit read, surfaced 420 miles - 33 hours average speed 12.75 knots and underwater 2525 miles - 307 hours average speed 8.22 knots. The reliability of the submarine, its machinery and systems were such that the underwater passage and the accurate landfall at the end proved to be completely routine. It was an accomplishment that brought much satisfaction to her builders and her crew. All three of Canada's Oberon Class submarines were named for First Nations peoples. HMCS Ojibwa is named after one of Canada's largest groups of indigenous peoples. At the height of their power, their territory stretched from the shores of Lake Huron to the edge of the Prairies. Today, there are reserves in the Canadian provinces of Ontario and Manitoba and the American states of Minnesota and Wisconsin. Also known as the Chippewa, the name is said to refer to 'people whose moccasins have puckered seams'. Those moccasins helped them to be silent hunters and warriors. HMCS Ojibwa is proud to bear the name; however, be assured that there are no puckered seams aboard this sleek lined beauty.